Happy birthday in heaven, my sweetheart! You were my life partner, my friend, my daily companion and my everything. Life has become painful without you and I’ve become incomplete. I wish I could meet you soon! My dear aunt, happy birthday! I still can’t believe that the person I admire the most is not alive. For me, you were like my mom who always considered me as her own child. It’s your first birthday without you. May God give you the eternal peace! My dear nephew, happy birthday! You were a child whom everybody loved the most. You used to keep the house lively with your naughtiness and mischief. Everything of yours is as same as before, only you are missing. Wish you a wonderful day in heaven! My dear better half, happy birthday! Today is your 60th birthday and I wish you were here with me to celebrate his wonderful age! You are the heart of my life and without you, I’ve become like a walking dead body. Miss you a lot! My sister by heart, happy birthday in heaven! The most shocking moment for me was when I had known that you are no longer with us. I can never forget the time we have shared together. You’ll always be in my mind and will be missed forever! My dear sister, the most awaited day of your life has come but you are not here to welcome this new year of your life. I don’t know, why you’ve gone to heaven so early, why you didn’t think about me before leaving me. I miss you every moment. I wish I can see you and touch you at least once! My beloved mom, happy birthday! You were the one whom I love the most and today I can’t do anything for you except praying. I miss you in every step of my life. I know that the most beautiful star in the sky is you. Have a lovely day with the angels! Dear uncle, today is your birthday and you are far away from us. Happy birthday in heaven! I miss your love, care, affection, support every single day. I wish I could spend some time with you! Love you uncle. May your soul rest in peace! Happy birthday, my dear friend! Your death is the saddest thing for me. To me, you were like my brother from another mother. You have a special place in my heart which will be never replaced by anyone. May God give you much peace in heaven! 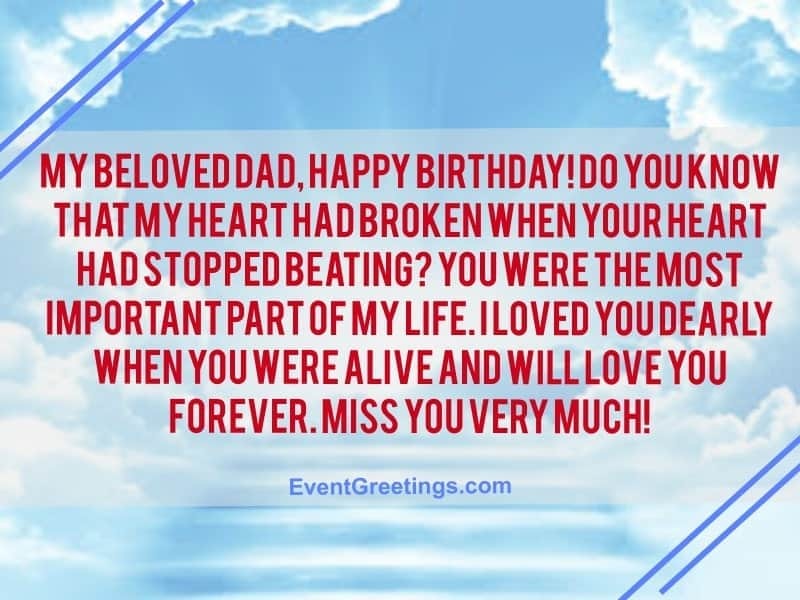 Dear dad, happy birthday in heaven! You were the one I admired and respected the most. You were my inspiration and my idol. I miss your love, your smell and you. Your clothes, books, and spectacles everything are kept in the same way, just you are not here with us. May your soul be at peace! Happy birthday, my mom! Though you are not with us today physically, you are and will always be in our heart. Love you mom and miss you a lot! May you rest in peace! Dear mom, you were a blessing in my life without whom I’m an incomplete person. I don’t know how, but I can feel you everywhere. I know, you can see me and always give me your blessings. Happy birthday in heaven! This day was the happiest day for all of us during the previous years because it’s your birthday, mom. But today we are very disheartened because you are not with us anymore. Happy birthday, mom! Happy birthday mom! I miss your presence, your fragrance, your hug, kiss and everything of yours. You are the one with whom I’ve spent all the good times and now I have with me only the memories of you. Miss you a lot, mom! Happy birthday, mom! I wish you were here with us today on this special day! There’s no word to comfort me and there’s nothing to heal the pain because there’s no one to love me like you. May God keep your soul peace! My mom, you had gone to the heaven so early and made me alone. It’s quite impossible for me to learn to live without you. You are always missed in every function. Love you, mom! Wish you a very happy birthday in heaven! There is not a single day that we didn’t miss you mom. Everything has changed when you left us. I feel crying when I think that I can’t see you or hear you anymore. I miss your touch, your love, and care. I know, you’re happy there and wish you a very happy birthday in heaven! Dear mom, happy birthday! At least today, I wish you could come back for a while because I want to hug you tight! I know it’s not possible because you are an angel now. May you have peace in your soul! Lots of love for you. Happy birthday to my mom in heaven! I ask God to send you a beautiful bouquet on behalf of me on this special day and to tell you that I love you and I’m not okay without you. Missing you, mom, today and forever! The hardest thing for anyone is to stay strong after losing the most special person. Each day, I’m trying my best to overcome this pain but I become failed every day because it’s hard to live without you. Mom, may you have a great birthday in heaven! Happy birthday in heaven, dear dad! You were my strength and my superhero. The hole of my heart will never be filled. I know, one day, we’ll be together again but until then you’ll be missed. Dear dad, after you’ve gone, I didn’t only lose my father, I lost a friend also. You taught me everything that is needed to become a good human being. Today is your birthday but you are no longer with us. Happy birthday in heaven, dad! You will be remembered with much love not only today but every day of my life. My dear dad, I still feel strange when I think that, you are dead. The time that we spent together has now become the memory. I wish you could feel our love and hug. 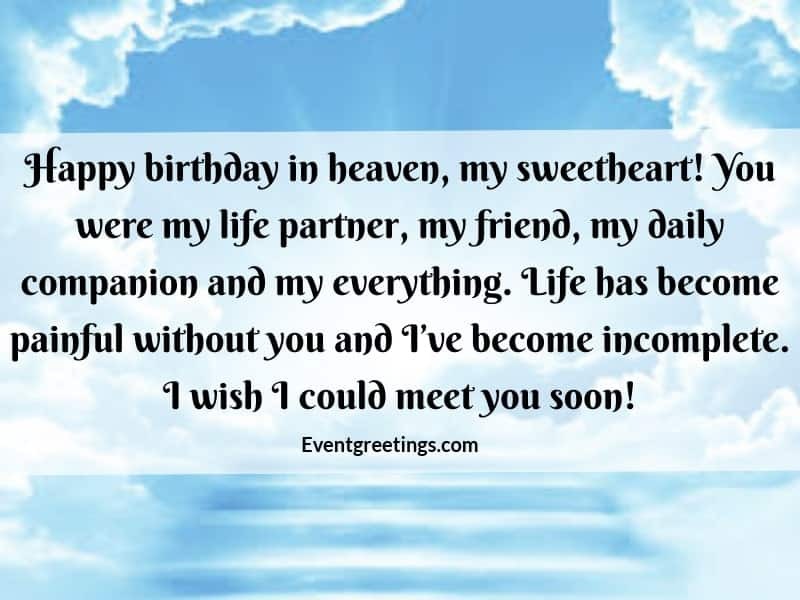 Wish you to have a wonderful birthday with all the angels in heaven! My beloved dad, happy birthday! Do you know that my heart had broken when your heart had stopped beating? You were the most important part of my life. I loved you dearly when you were alive and will love you forever. Miss you very much! Happy birthday in heaven, dad! You were the one who advised me, guided me and did everything for the welfare of my life. You may not be here with me today but you are in my heart and will always remain there. Today is the birthday of the best father in the world. Happy birthday, dad in heaven! Whenever I think about the days we’ve shared together, I smile. I miss the laugh we had together. You are the one for whom I always feel love and gratitude. Miss you dad! My dear dad, you are gone from the world and I feel that the big piece of my heart is missing. Today is the day you born and I would like to hug you and want to say that how much I love you. Happy birthday, dad! I wish you were alive to celebrate this special day! May the wind of heaven be blown smoothly and whisper to your ears to tell you that I love you and miss you. Today is your birthday dad, and this day has become a day of nostalgia since you left. I miss the days I walk with you by holding your hands, the days we celebrated together, the days I found you by my side. May you be at peace with God! My brother, today is your birthday and the bitter truth is that you are not with us anymore. You were not only my brother, you were my friend with whom I could share all my feelings. Always miss you, brother! Happy birthday in heaven, my brother! You are far away from us but will always remain in my heart. I wish we could celebrate this special day together! Miss you bro and want to hug you tight. My dear brother, my heart never accept the truth that, you will never come back again. For me, you were my elder brother, my teacher and sometimes a father. And I miss your guidance, your governance, your love and your companion. Have a beautiful birthday in heaven! My brother in heaven, happy birthday! I still can’t imagine that you are not with us. I can feel you always everywhere. All of your things are there in the same place, just you are missing. My best friend, my brother, happy birthday to you and me! We came into this world together but you left me alone and have gone to the heaven first. And the painful thing is, today I have to celebrate our birthday without you. My life without you is incomplete and I’ll miss you forever, my brother! My beloved son, happy birthday! You were the most precious gifts in my life but I’ve lost you. The hardest thing for me is to face the reality that a young and cheerful boy has gone to God so soon. May God give you peace in heaven! The most pathetic thing for any parents is losing their child. My son, after you’ve left me, I feel that life has thrown me into the trash. Only I know the pain that I’m going through every day. Today is your birthday and I wish I could bring you here again to love you! Stay happy in heaven. My lovely boy, today is the day you came to this world. But God has called you so early to the heaven. I can’t explain how I feel without you. You were my daily companion and every single day I thought about you. May you have a wonderful birthday with other angels in heaven! Happy birthday, my son in heaven! The emptiness that has created in my heart since you left me, will never be filled. No one can ever replace your place. Your mom loves you a lot and wants to meet you soon. Stay peaceful in heaven! My dear child, there’s not a single day that I do not remember you. You’ve given me only the good memories and it’s impossible for me to forget you and your special day. Happy birthday, my son! Love you and miss you a lot! I wished that your time on Earth was longer. I wished that your love could grace us further. But most of all, I wish that you have a happy birthday up there, surrounded by love and grace. Your presence with us during your time on Earth has been nothing short of a blessing. We miss you dearly, but we know that you are in good hands alongside God. Happy Birthday dear. If we can send letters to heaven, you would have received so many letters filled with our love and longing for you – especially on this special day when you first graced us with your presence. Happy birthday my beloved daughter. If only you knew how much we miss you. Not a day goes by when we don’t think of your beautiful smiles and sweet laughter. Happy birthday, mom. It will never be the same without you around. 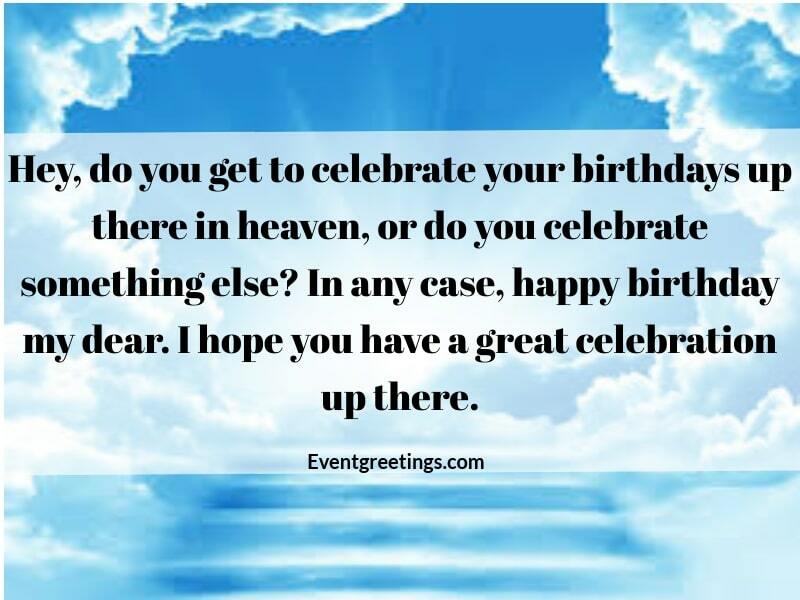 Hey, do you get to celebrate your birthdays up there in heaven, or do you celebrate something else? In any case, happy birthday my dear. I hope you have a great celebration up there. Dearly beloved, your children and I are sending you our best wishes from earth. We miss you so dearly. We hope you can have a great birthday up there in heaven! You were the star that shined the brightest in the night, and so tonight when the moon comes up, we will be looking at you and thinking of all the good times we had together. Happy birthday. It’s still difficult to accept that you are no longer celebrating your birthdays with us. We wish you a happy, blessed birthday regardless, and we hope that you are doing great in heaven. Happy birthday dad. Your time with us was short but filled to the brim with memories that we will still be reminiscing years to come. We love you. My best friend, you are gone but far from forgotten. We would have gone for a drink on this day when you were around, but today, let this birthday card and my best wishes for you be the replacement. Happy birthday.